Jan 28, 2018-In the first week of January, Nexus Culture Nepal at Bakhundole hosted a rather interesting event called ‘The Loudest Voices You Never Heard’. Brainchild of artist and artivist Ashmina Ranjit, Nexus is associated with Lasanaa, an ‘artivist’ community organisation, and is itself fast turning into one of Kathmandu’s most active alternative art spaces. Ashmina’s focus has always been on bringing local and international artists, art and the community together. And ‘The Loudest Voices You Never Heard’ was a good example. 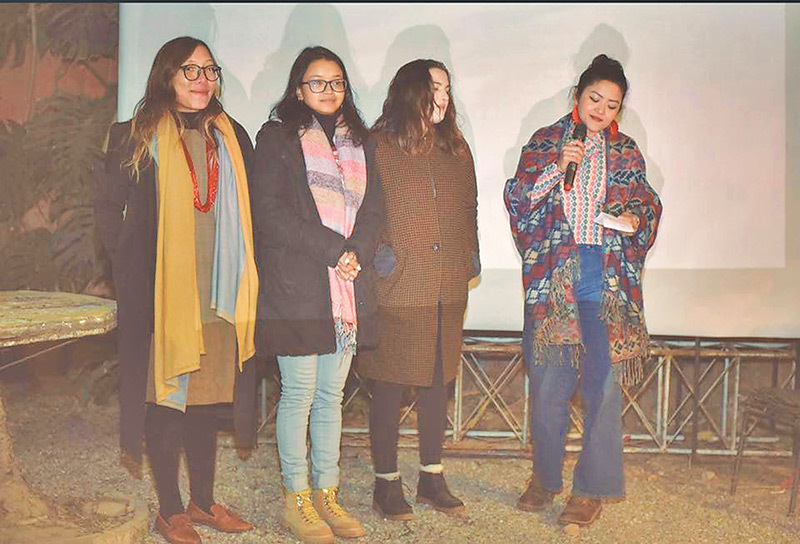 The January chill was setting in as Ashmina introduced the four participants, who were about to deliver an evening of personal stories through live performance and multimedia presentations. Bimina Ranjit is a Kathmandu-born multimedia journalist based in New York, who has produced an award winning documentary film Reviving Nepal Bhasa (2015) with the endangered culture and language of the Newar community as a subject. That evening she gave us a glimpse into Newar culture again, but on an extremely personal note—she presented us with a verbal and visual documentation of her experience as a daughter of a Newar family, who had just lost her mother. Her grief was offset by her bewilderment with the rituals and practices that were so obviously discriminatory towards immediate female relatives of the deceased, and in this case her own self and her sister-in-law. The story was not comforting for it was narrated in her trembling, weepy voice and accentuated through photographs and recorded interviews with her equally bewildered husband. It was obvious that tradition and rituals treat a daughter, especially a married daughter, very differently from a son at a time of familial loss. And it made the audience wonder whether it is time to do away with at least some of them. After all, it devalues a state of mourning, if the grieving female is further aggravated emotionally because of out-dated customs. Punjita Pradhan spoke next with ‘Understanding Violence’, and addressed violence through the story of her own life as someone battling Borderline Personality Disorder (BPD) all her life induced by the violence and abuse meted out to her by strangers and acquaintances during her childhood. She survived a suicide attempt in her teens, but her spine was damaged forever, and she has to keep resisting the stigma that Nepali society sends her way every day. 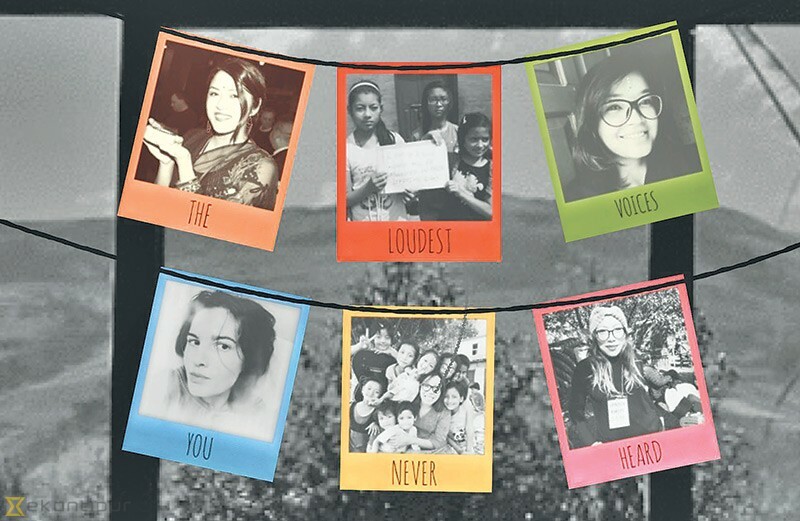 She fought all odds to become a successful journalist, and she is also the founder and chairperson of Utkarsha Nepal. Through her organisation she is doing her best to counter such societal behaviour. Her story was one of bleak stretches of emotional distress and violent behaviour lit up by sparse moments of support coming from parents, friends, colleagues. And success in her profession. It was the act of moving away from psychiatrists and medication and embracing healthy eating, and meditation that turned her life around. Among other things, she now provides coaching to survivors of trauma. We need to hear more such stories to raise awareness, so that we can learn to be supportive of those suffering from emotional wounds and the resultant violent behaviour, instead of adding to their misery. Haushala Thapa came on stage next to share her story. Her journey started at the age of 23, when she rescued 14 children from an abusive orphanage in Balaju and gave them a safer childhood. The number has grown to 65 in an NGO-run, residential home called Children and Youth First. She also supports marginalised women through, the Haushala Cooperative which has now expanded into Haushala Creatives. There is also a school that houses 200 children while teaching 500 in total. But the story Haushala shared that evening was not about the work she was doing while changing hundreds of young lives for the better. It was about her own journey, and the sadness that lurked behind all her accomplishments. ‘But why should I be thinking about me? I shouldn’t be thinking about me…I should be thinking about my kids,’ she said at one point during her talk. She needed to be alone to overcome the loneliness she felt within and to recuperate her energy in order to continue with her tasks, but people around her did not recognise this. So she decided to travel among strangers and spend long stretches of time immersed in nature, often around trees. She sat under trees and reflected upon her life, her weaknesses, her own emotional needs and insecurities, and how she had been a source of energy to others without ever really replenishing herself. She travelled across India, Thailand and California and came back to her projects in Nepal, completely reenergised, and felt strongly that one must take care of oneself first to be able to take care of others. It is important to encourage and empower oneself too, to nourish one’s own self esteem before being an energy source for others. Every caterpillar does need to cocoon itself before turning into a butterfly! On the surface, this was a story that sounded inconsequential. I, however, felt it was stories like these that should be told more often, to more people, for we all are struggling to come to terms with the manic pace of the contemporary world. The evening ended with a performance Elyse Blennerhassett, a sound artist and audio producer. ‘Recording sound, from oral histories to soundscapes is one of her obsessions. Or perhaps it is the other way around, her obsessions compel her to record sound. With sound she seeks to address alterity’, read the introductory write-up. Having suffered through a coma in 2012, as a result of having contracted a mosquito-borne disease in Uganda, she went looking for the meaning of life and found it in a strange set of people. Her meeting with Ethan, a man who had been convicted to a life term in prison when he was just fifteen, changed her life. She realised that here was a person who had reached the age of 44 by fighting a system that tried to destroy and erase him from earth. A man who wrote to her saying that ‘your attitude is your destiny, never take it for granted.’ She began documenting his life in solitary confinement through phone calls and letters and presented it through a haunting audio-visual created with images of the sky as it would look from his cell window, the clouds moving in time lapse to the sound of his voice on phone as it narrated his thoughts and emotions, sometimes dissolving into water and bubbles, blades of glass, a bird flying free. The accompanying soundscape was exceptionally beautiful, and took us back to Tarkovsky’s aural world. Ethan teaches classes, practices activism and writes poetry in prison now and everyday he fights against erasure and invisibility. The day Elyse delivered the talk at Nexus, Ethan had spent 10, 465 days in a prison and still had the tenacity and strength to negotiate life on a daily basis and try and make it better. I , like many others in the audience, was moved to tears. I was not moved by a sense of empathy for a fellow human being, but by his sheer resilience and the power of Elyse’s imagination. I later learned that she is currently creating an audio documentary featuring the voices of men, who were sentenced to die in US prisons in their youth . ‘The Loudest Voices You Never Heard’ was important not just because it gave a platform to people fighting injustice, trauma, stigma or failure. It allowed stories that lacked glittering twists and striking completion, yet stories that need to be told and heard. Our internet and social habits now habitually promote only the extraordinary and the spectacular. We are in need of spaces that allow the small and the not so significant battles we fight everyday to have a voice, to be recognised so that they can grow into an avalanche for the very necessary and monumental changes in society.